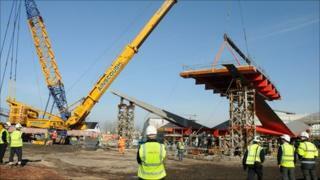 A new £2.5m bridge linking BBC Wales' new drama village to Cardiff Bay has been lifted into place. It is the latest stage of work at the Roath Lock site, which will be home to dramas Casualty, Pobol y Cwm and Doctor Who, as well as future commissions. BBC Wales currently produces drama at sites including Llandaff in Cardiff and Upper Boat, near Pontypridd. The first filming is due to start at the drama village in the autumn. The bridge was broken down into 12 pieces to allow transportation to Cardiff Bay from where it was manufactured in Newport. Keith Jones, director of BBC Wales, said: "This innovative bridge will be a gateway for the creative industries in Wales, bringing world-class productions to the heart of Cardiff and taking Welsh-made content to the UK and beyond." The 170,000 sq ft (15,800 sq m) Roath Lock site is equivalent to the size of three football pitches.